This raccoon family had a den in a large oak tree. Early each morning mom would leave and forage for food on the ground. The cubs usually ventured out later, and sometimes they would climb head first down a large vine to the ground. On this particular morning, I got lucky when this cub decided to back down the vine, allowing me to capture this portrait. Please click on the image to view the uncompressed version. Thank you. Nikon FX, Nikkor 200-400mm + 1.4X, f/5.6 @ 1/100, ISO 1600, Gitzo Tripod, Wimberley Head II. Ron, this is beautiful! You have captured the essence of this little character perfectly. The detail in the uncompressed view is a real treat! Sensational photo with remarkable detail, Ron. 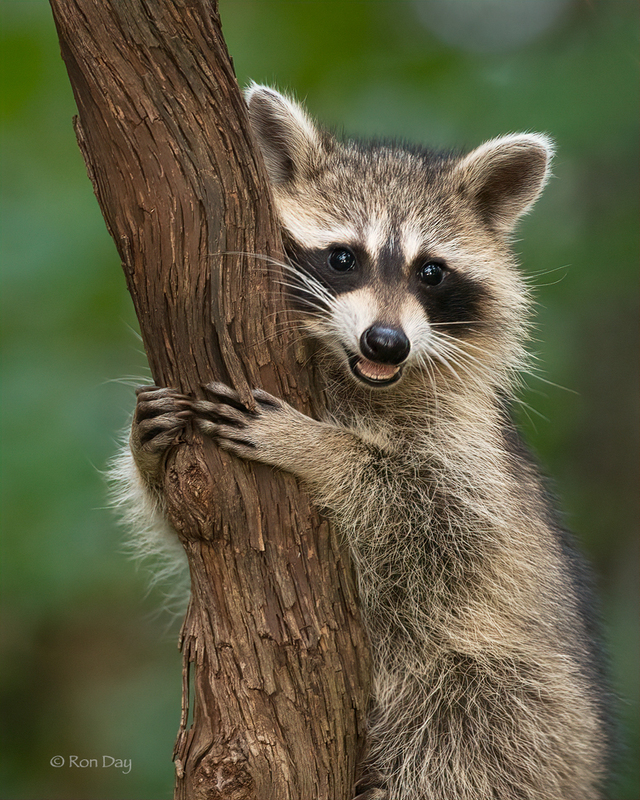 A great shot Ron, amazing detail & a priceless expression on this Raccoon. Uh, Oh. Cute factor ++++! Just look at those bright eyes. I know animals don't really smile, but this one seems to. Or is it just that it made me smile? . Either way, a total charmer. Super shot with amazing detail! Wonderful expression! Congrats. Very nice portrait and story. nice one with the superb details and the splendid bg makes it for a cute shot, awesome RON. Thanks everyone for taking the time to comment – it's greatly appreciated. And thanks to NatureScapes for the EP. It's an honor. Not sure you could have gotten a better image of this little bandit Ron, wonderful image. Very cute shot Ron, super sweet portrait!